I picked up this lace skirt at Coco's on the Green in June when they were having their annual half off sale. That was the weekend I got my fabulous Ferragamo slides, and while I also tried this Miguelina skirt on, I put it back, deciding to just get the shoes. I left feeling good that I'd resisted. The following weekend I got an email saying the sale had been extended. The next day I walked straight in, bought the skirt, did not look at anything else, and left. It was only $15, new with $200 tags, I could have done worse, right? As for why it took me nearly three months to finally wear it, that I can not say. I love gingham, and this whole look. I have a similar gap top that I love putting under my sweaters for a little extra color this time of year! Oh my goodness so cute and I LOVE it with the tied-up gingham! The most darling transition look! Indeed! Well done! I think the universe was rewarding you for your willpower! Also--yay cherry shoes! So cute! I always buy things and they sit in my closet for months. Matter of fact, when I switched my closet from summer to fall I had tona of clothino items that still had the tags on it. Ugh! You look fab! Such an amazing skirt! You totally styled it perfectly. I cannot imagine how you went so long without wearing it ! I think this skirt is over the top gorgeous ! I can imagine it styled so may ways. It was meant to be. That lace is so pretty and love it with the chambray. What a fantastic score! The skirt is gorgeous and something you will wear for years. White lace skirts are one of my favorite pieces to add to your wardrobe! looks lovely! Wow, what an awesome find! Such a classic piece too, it will get lots of wear I'm sure. It's pretty this way with the gingham shirt! Ahhh!! Such a beautiful skirt and love how you wore the ghingham shirt with it!! Love this outfit..
Oh my gosh...those shoes with the gingham shirt?! So cute! I love the skirt too and you got an amazing deal! I cannot believe you got such an amazing deal on that skirt. It is beautiful. I love it paired with the gingham top too. Um, that skirt is a major score! I love it so much. So much that I am a little jealous. And how cool are those heels!? You look awesome! Such a chic look! 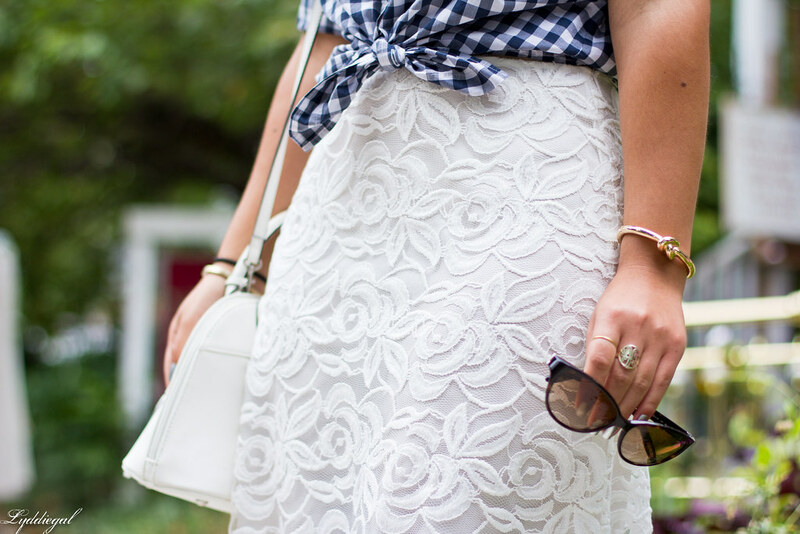 Loving the gingham and lace combo! And those shoes are so adorable! 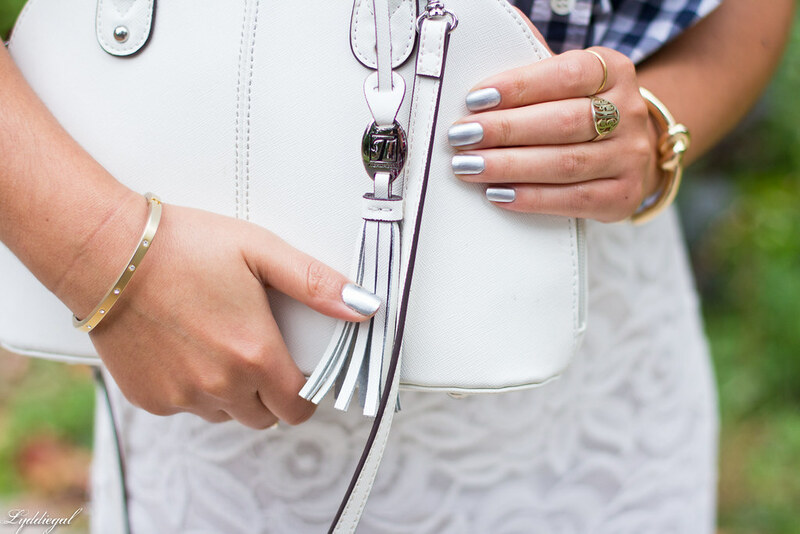 Love the skirt and I'm digging the silver mani. Beautiful skirt and it looks so fresh with your gingham top! Good for you and your willpower! Great skirt! And such a good deal. Love it! The price you paid, was simply fabulous! HAHAHA Love your top and necklace. So pretty. BEST DEAL EVER! I love how you paired this elegant skirt with a more casual top! It looks stunning! That skirt is perfection! I can't believe you found it for $15! How you resisted it the first time is beyond me! I love those adorable shoes, too! Love your skirt, amazing fabric! I love this look. The pencil skirt is beautiful Great finds! Those cherry shoes are EVERYTHING!!! U R A VISION!!! Love your gingham shirt!!! That skirt is a steal and so pretty! love this!! the lace and gingham make a great combo!! Oh wow, that skirt is stunning. I really really love how you styled it. And you just reminded me that I should pick up a gingham shirt. Fabulous! Ah the thrill of a great steal! We are gingham twins today :) Love this lace skirt and what a find! That skirt is gorgeous. I have a white lace skirt myself and it's one of my favorites. 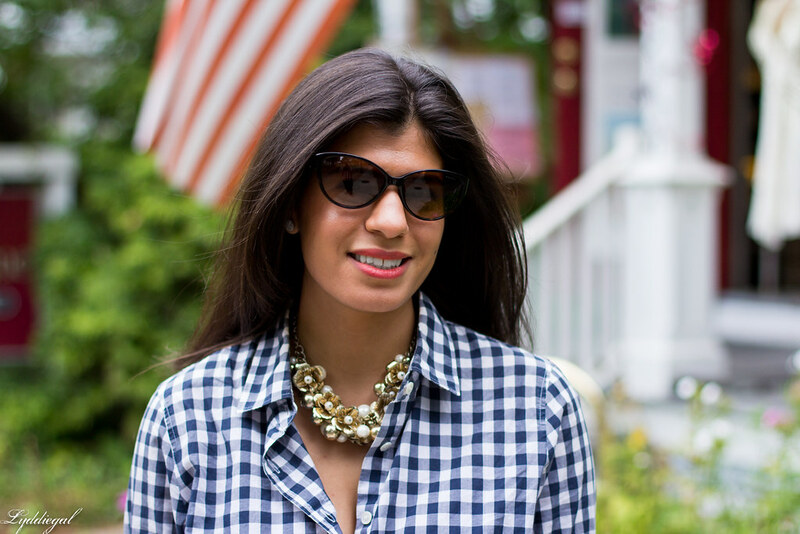 Love it paired with this pretty gingham--I've never worn mine like that, but thanks for the inspiration!!! You look fantastic! So ladylike yet effortless. The skirt is fantastic, but I can't get my eyes off of those fabulous sandals! You look very well put together! I love the pairing of the gingham shirt with the lace skirt. The shoes are so cute. I love the camo jacket!! Such a cute combo, loving the lace & gingham! You honestly cannot do any wrong with your outfits. Can we say that this was a HUGE steal. Would love for you to link up this outfit on my Thrift Sisters Link Up. We feature thrifted or thrifty priced (such as your skirt) to inspire others.